Updated: Newvem, which promises to watch your Amazon(s amzn) Web Services usage for you and recommend ways to get the most mileage out of rented compute and storage, is now ready to charge for its services. Large enterprises will negotiate their own deals, but for smaller accounts the company will offer free services until the customer goes over 50,000 AWS resource hours per month. Then it charges a cent or two per additional resource hour depending on usage. According to Newvem’s price list, there are additional fixed-rate charges for more advanced analytics of S3 storage or EC2 reserved instance use. There are a dozen or so companies in this AWS stalking market and they all claim to do what the others cannot. Cloudability, which now says it monitors $250 million in cloud spending, charges customers a percentage of their overall cloud spend after a free 30-day period. Dublin-based CloudVertical offers similar tiering. Cloudyn offers basic services for free, then tiered pricing for more advanced services above that. There will be more third-party analytics and reporting services coming down the pike. One newbie is New York-based CloudAware, an AWS consultancy that has done monitoring and analytics work for AOL, Sony and Reed Elsevier (see disclosure) and is now looking to sell a service based on that work. CloudAware will provide a service that alerts management, via a news feed-like feature, to any changes in configurations to AWS resources, said CloudAware CEO Mikhail Malamud. “If someone launches a firewall change and that change is on a non-standard port that will kick off an approval request,” Malamud said. These Amazon partners all fulfill a need by enterprise customers to get a better grasp on what many see as a black box. For one thing, Amazon services are billed as cheap and easy, but cheapness is all relative. At least one Amazon expert experienced unexpectedly high charges moving S3 data to Amazon’s cheaper Glacier data archiving service for example. So there is a real need for services that monitor and alert customers about their AWS usage. Nuances aside, these companies all compete with each other. But probably more worrisome longer term for the startups in this space is that Amazon itself keeps adding deeper and broader billing and analytics capabilities. Offerings like its Trusted Advisor service, now in beta and more granular billing, are eating away at territory these small companies have staked out. The next year or so will, for sure, be an exciting ride for partners in the Amazon ecosystem. Disclosure: Reed Elsevier, the parent company of science publisher Elsevier, is an investor in Giga Omni Media, the company that publishes GigaOM. Franks, trusted advisor is a great start but what we see with larger customers is that its recommendations are not always good and they go nowhere. In cloudaware, you can design your own “trusted advisor” style policies and customized them to your needs e.g. volume has not been attached in X days. CloudAware will then open a case and assign it to a queue based on case assignment rules also customized by you. You can also create trusted advisor policies that look beyond amazon and check via api whether server is in zabbix, nagios or zenoss or whether it has intrusion detection installed on it. I still struggle to understand why people don’t just use AWS trusted advisor instead of all these 3rd party tools. Also why would Newvem charge like this? I think we will need a tool to analyse our Newvem usage and provide recommendations on how to save money! I might be better off linking one of our AWS accounts and looking at the recommendations and go do the same for all my AWS accounts. We manage about 4 million dollars per month in AWS spendings for few big customers. 97% of the savings are in reserving the instances. Just reserve your instances, the rest is not that important to your bottom line unless youâ€™re really counting EVERY penny. I agree with Joseph 100% that charging per hour of AWS resource use is precisely against the supposed benefit of being able to optimize AWS consumption by using Newvem’s monitoring tools. We were actually thinking of trying this service but now, knowing that it’s not in Newvem’s interest to save me money, (they will make less money! ), I’ll pass. 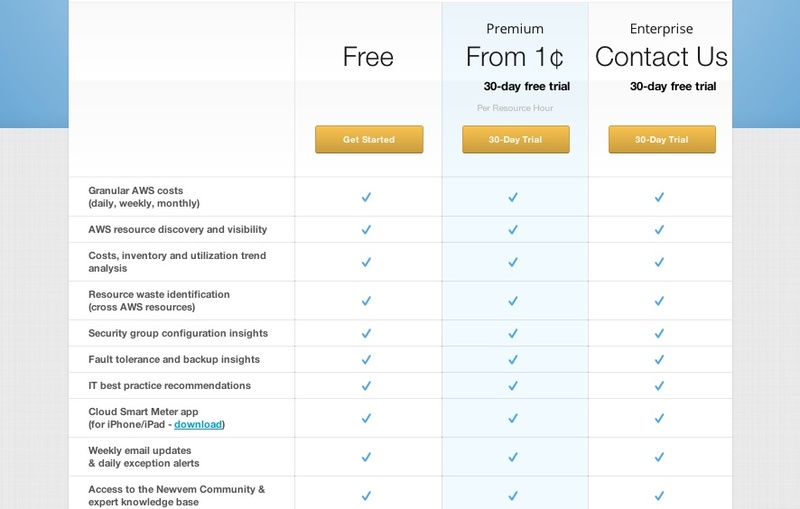 NewVem pricing is a bit odd for me, as it’s exactly against their “predictability” and “visibility” premise. I don’t know how many compute hours i’m using and frustrated with a complex AWS bill. How the hell i will know how much i should pay NewVem? You’ll have the same visibility on your consumption of Newvem’s services as the visibility Newvem gives you on your AWS consumption. This makes it natural to price our service based on the volume of resources tracked and analyzed on an hourly basis. Exactly because it provides you with the visibility and predictability of your AWS usage, Newvem lets you know precisely how many AWS resource hours you’re using, as well as where and how you’re using. No frustration with AWS, guaranteed: Newvem will help you know how many compute hours you’re using. I agree that the future does not necessarily look rosy for some of these AWS monitoring startups as Amazon seems to be getting more and more savvy in producing it’s own tools (probably as a direct result of the startups themselves). But as there is more and more talk of traditional IT functions moving outside IT’s control ( http://ow.ly/gejml ) is that the next marketing push they should be looking for? For example does it make a difference if your customers are an IT department or a marketing department?